If you take action when your head and soul aren’t aligned, it can be a risk. Like a $2400 risk. Sometimes opportunities that are presented to you appeal so much to one part of the brain, you rationalize yourself into a decision. Has that ever happened to you? You bet your bottom dollar it has happened to me. Here is my $2400 lesson. So I started telling my friends and family about my ‘new’ venture and started to sell memberships. Here are my lessons learned. 1. How NOT to Sell. I was a mess. I ended up spamming everyone I knew. Reflecting back on it, here is an official public apology for my douchy, repelling marketing (I don’t even think it qualified as marketing) techniques. My heart was in the right place, but I did not think about the customer’s perspective. I hate it when people come at me in a spamy way and I did the same exact thing that made my skin crawl! It was a hard but necessary lesson to learn. Tweetable: When you offer a product or service, always place yourself in the shoes of your customer. 2. Importance of Personal Brand. I thought this opportunity would be a great side business where I could generate income to support my start up business. The problem was I diluted my brand. I was doing so many random things at once, my vibes were all over the place. I was a mess. Tweetable: When you are developing your brand, ensure everything you do supports that brand. When you are congruent with your heart and soul that’s when the magic happens. When the work you do is aligned with your passion and purpose, you hit the sweet spot. The area where you can be confident in moving towards your dreams. It is a glorious feeling. Tweetable: When you are aligned with your purpose and passion, success & happiness is organic. Biggest learning I received in my life. Find the lesson in EVERYTHING! Life happens. We can’t control what happens. But what we can control is how we react to it. We have a choice. We can choose to let it hold us back and keep us small and contracted in life, or we can choose to learn from it, expand and rise above it. I always choose the latter. The best part is the choice we decide to make is 100% in our control. The $2400 Lesson was an invaluable one. I considered so many things. What I DIDN’T consider was my soul. Was this aligned with my purpose in life? Was I really passion about it? If I posed those questions to myself perhaps a different decision would be made. 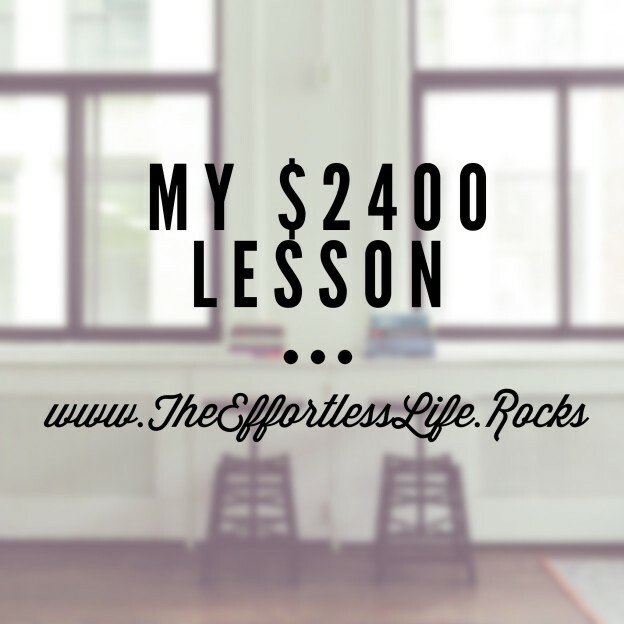 What $$ Lessons have you learned? This entry was posted in Blog and tagged alignment, journey, lessons, life, mistakes, perspective, Purpose, soul on August 11, 2015 by Theeffortlesslife. I had a rude awakening recently. It brought to life my new mantra. 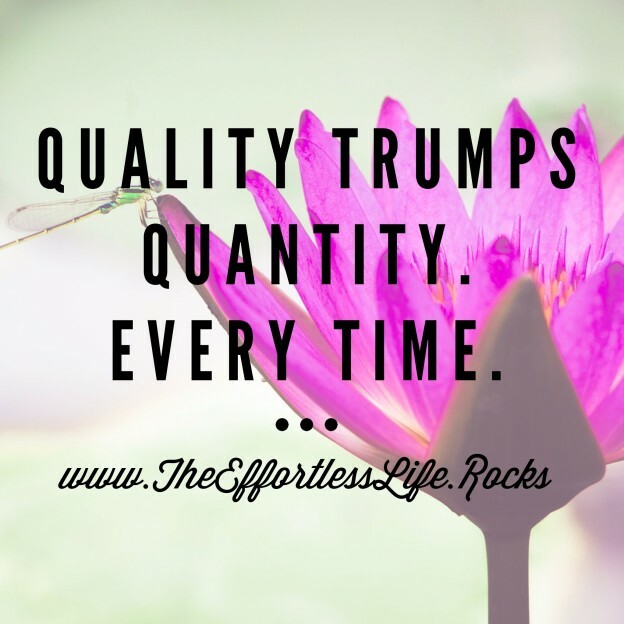 Quality will always trump Quantity. No it didn’t come from a seminar (which would be a great guess, as I am a personal development junkie). It didn’t come from an eye opening article. It didn’t even come from a client. It came from my 9 year old daughter. My ego took over. I told her although I would love to take off and be able to hang out, I had a business (which I am giddy over) to run. A few days later, as I was about to go to bed, it hit me. My kid wants to spend time with me. In a few years the roles will be reversed and I’ll be dragging her to hang out with me. I have a business where I am always “plugged in”. I started my own business so I could spent more time with my family. A business where I could take off and spend a couple weeks with my kids before they go back to work. I realized just because I was “physically” there, it didn’t mean anything. If I’m not present and in the moment with them, they may as well have a babysitter. In the past, I would have overwhelmed with feelings of guilt, regret and feeling like a crappy Mom. Ever since I have been able to step into and release negative emotions, like has gotten so much sweeter (& productive). So, I am going “dark” and unplugging from social media for a week. I turned off all of my notifications on my phone. We get so caught up in Facebook, Twitter, Instagram, Periscope. I felt like if I was not checking it, I would miss out. So I would constantly be on my phone. I would “have” to see each notification. Check out all of the likes I would get. Somehow that proved my worth. I realize that is silly. I realize I don’t need validation from any social media post, from anyone or anything. I am worth it. Period. So, it’s time for a change. I am shaking things up and unplugging from social media. I am going to use that time to be present. I’m using the time to grow and realize how I want to contribute the world. I’m using the time to make some freakin’ rad memories with my kids. I will post once a day to share my reflections but that’s it. Making that choice was so powerful (& will definitely be a challenge). But, I believe, what doesn’t kill us makes us stronger. Sometimes we work so hard to build a future for my family. It’s a great theory, but not at the expense of sacrificing unwritten memories. It was a wake up call, loud and clear. And I’m doing something about it. Sending you love, light & oodles of positive vibes. 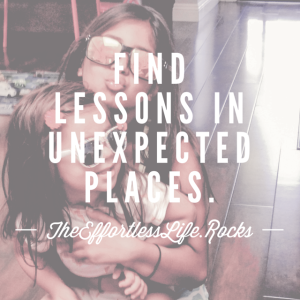 This entry was posted in Blog and tagged love, parenting, perspective, presence, Purpose, social media on August 7, 2015 by Theeffortlesslife. Just imagine for a moment. Imagine you are 65 years old, have a huge family, with kids and grandkids. Although you loved them dearly, you hid a huge secret. You hid who you were at the core. You couldn’t share with them who you really were because you did not want to hurt them. In my life, I felt this way because I grew up in Pennsylvania in a predominantly Caucasian demographic. I was so different. From my name, to my dark complexion – I felt like an outsider. When my first grade teacher attempted to promounce my name, I quickly corrected it to “Annie”, my childhood nickname. And I used my nickname all through college. When I was in my late 20’s, I had an incident that rocked my world. I walked by a mirror and caught a glimpse of myself. I stopped and look a closer look. I didn’t recognize my reflection. It shook me to my core. For the next 8 years, I was on a path – a mission to find myself and just be me. I ended my marriage. I manifested my soulmate as divorced Mom. I left Corporate America after 16 years to fulfill my purpose in life. I have realized all of my experience in my life has given me the knowledge and expertise to help others. 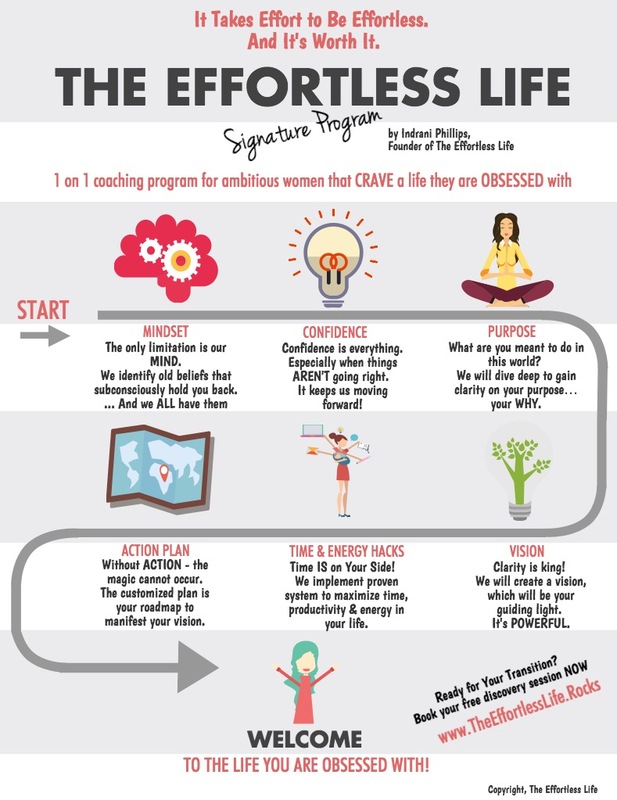 I help others manifest a fulfilled life with time for passion, self-care and presence through strategy and mindset. 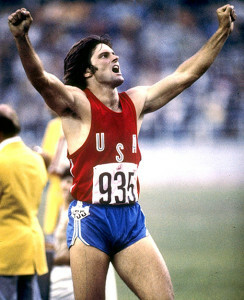 When I watched Bruce Jenner’s journey, I looked back on my path. I was filled with emotion. When I made the decision to be my authentic self, I made huge changes that impacted the people closest in my life. I am proud to say that my daughter is so much happier as a result of my life choices. I can show them they can have it all. I am living my life on purpose and they see that everyday. They know they can do anything and be anything. Always remember to Be You. Everyone Else is Taken. This entry was posted in Blog and tagged Authentic, divorced Mom, life, love, manifest, Purpose, Selfcare on April 25, 2015 by Theeffortlesslife.